Would You Go $6,000 for A Clean 1991 Toyota MR2? 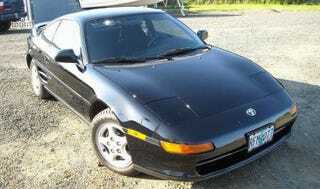 The ad for today’s Nice Price or Crack Pipe MR2 says it’s the cleanest you’ll ever find. That may be the case, but does that still mean that its seller will clean up at his asking price? It may not be Shark Week, but yesterday’s shark nosed 1983 BMW 633CSI sure proved to be a great white, er black… Um, I don’t like where this is going, so let’s just note that it came away with an 85% Nice Price win and move on, m’kay? Okay, moving on. Do you remember how Neville Longbottom got suddenly hot in the last of the Harry Potter movies? That was no doubt a shock even to him. That sudden sense of desirability can make it hard to know just how to act, which is likely how Toyota felt when they released the MR2, a left-field mid-engine sports car addition to the company’s otherwise too-staid-to-get-laid product lineup. Oh sure, they had the open-shirted Supra, and AE86 Corollas were still fresh in everybody’s memories, but the MR2 was something totally unexpected from what was generally considered to be the Ambien Brand. The first MR2 took its engine from the Corolla, and its styling from Ferrari’s Mondial, perhaps not the best choice. The second generation (W20 internally), as exemplified by this 1991 5-speed edition, offers styling that’s a lot less derivative, and an engaging 130-bhp 5S-FE from the Celica behind the seats. This one isn’t turbocharged so perhaps it’s only the second most dangerous car you could drive. Yes, these do have a rep for being somewhat twitchy, but you can easily learn to live with that, and it’s not like you’re asking it to perform a bris or anything. The thing about this one is that even if you do run out of talent at the limit at least you’ll be comforted to know that the EMS crew will likely be impressed by the cleanliness of the wreck as they cut you out of it. That’s because, even at 150,000 miles, this appears to be one tidy little Toyota. The car is black over black, and the cloth interior looks like it’s brand new. The only apparent wear inside being some minor pilling on the driver’s off-side bolster to say differently. On the outside the car is similarly nice, at least in the pics. It’s a little hard to tell if the factory alloys are curb rash-free in the pics, but one thing’s for certain, they sure are small! Remember when cars had little wheels like this? Yeah, you remember. The ad notes A/C, a smoke-free one-owner past, and as the kicker, a Kenwood stereo. Man, it just doesn’t get much more I-heart the ‘90s than a Kenwood, does it? The seller also claims this car to be the ‘cleanest MR2 you’ll find’ which sounds like a challenge to me. Of course I’m too lazy to accept that thrown gauntlet so I think we’ll just stick with this one and take a look at its price. The seller is asking $6,000 for this black beauty, and as those of you who actually did go looking for other, potentially cleaner examples will no doubt attest, prices on these cars are usually all over the board. There’s no getting bored with this one potentially, and so we now need to decide if its $6,000 price gets you in any way excited. What do you say, does this clean MR2 look to be worth that kind of scratch? Or, does that price make you want to wash your hands of the whole deal? H/T to both backdrifter and WindAdvisory for the hookup!